My DaBomb Burger with Balsamic Onions, double cheese, a toasted bun, and Donkey Sauce was inspired by my grandson and Guy Fieri. According to my grandson, it was “DaBomb! !” Most kids when they “earn” a reward they get an ice cream or maybe a small toy. Well, Beckett, being the 6 year old foodie that he is, has a love for cookbooks (along with soccer, basketball, tennis, swimming, baseball, and even school, and reading). Without a doubt he’s a lucky little boy to have the opportunity to participate in so many activities. Anyways, back to the cookbook. On his soccer team this year, they’re learning about playing positions (not swarming like a pack of bees). He’ll take you down on defense, but was holding back a little on offensive, so in a weak moment, his Dad said, “B, if you can score a goal today, you can pick out a new book.” Well, going to the bookstore meant one thing……..a new cookbook! 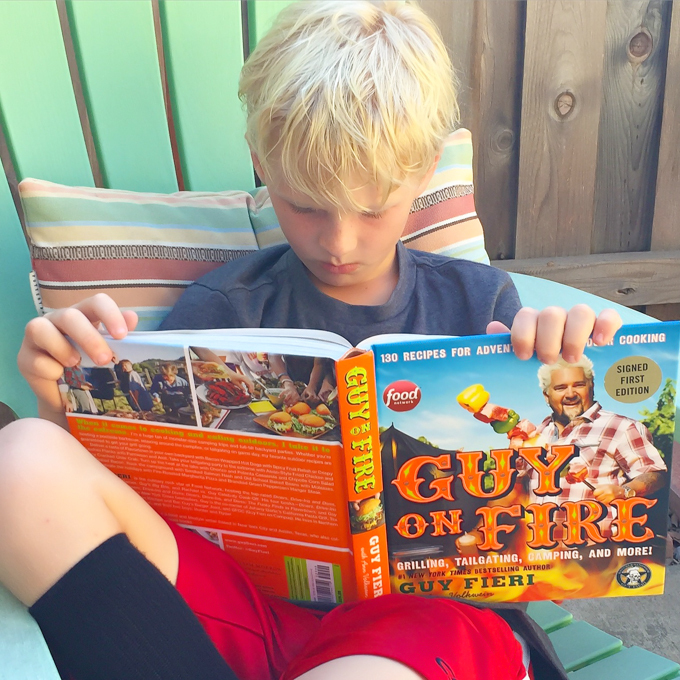 He went for his favorite Food TV Star and picked out Guy Fieri’s book, “Guy on Fire.” And so, dinner at Nana’s meant he could pick out what we’d be having. He went for Guy’s Straight Up Burger, with Nana modifications of course. This picture of him cracked me up. We were all in the house, and he was sitting outside, in the shade, reading through his new book. Of course, I had to grab my phone and snap this pic. We knew we wanted to grill our burgers, we knew we wanted to try Guy’s Donkey Sauce, and I knew I wanted balsamic onions. Turned out to be the perfect combination of flavors. And that is the long winded story of B and his cookbook and how our DaBomb Burger with Balsamic Onions got their name! 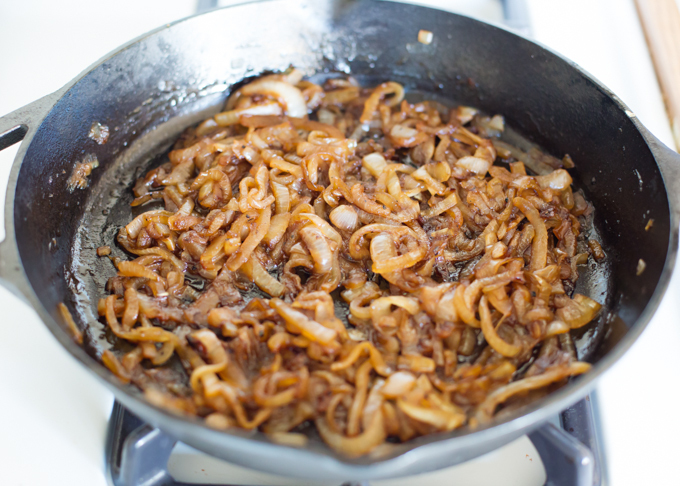 Balsamic Onions are simple to make, although they do take nearly an hour of time. You need to slowly cook the onions until they’re tender, then add the balsamic and sugar and continue cooking until they’re caramelized and sweet. While the onions were caramelizing, we cooked the bacon and roasted two heads of garlic. It just keeps getting better folks! 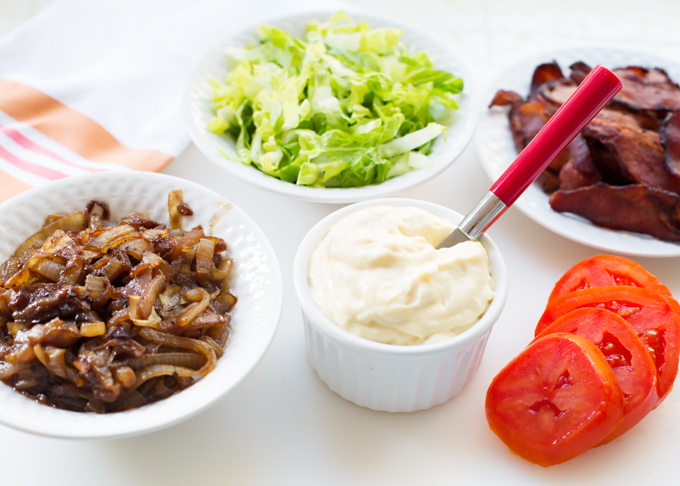 Crispy bacon, sweet Balsamic Onions, fresh produce and a bowl of Donkey Sauce. Did I mention the seasoned ground beef, double cheese, and toasted buns? Please remember, that sharing is caring, and I’d love if you shared my DaBomb Burger with all your burger loving friends!! My recipe is for the burgers with balsamic onions. For the Donkey Sauce, please see the link above. Heat med saute pan over med/low heat and add 1 TBSP butter and 1 TBSP olive oil. 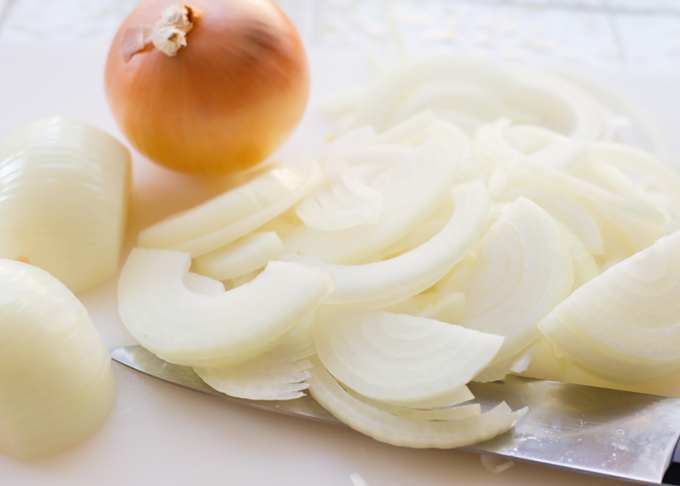 Add sliced onions. Add 1 tsp each salt and pepper. Cook over med/low heat for approx. 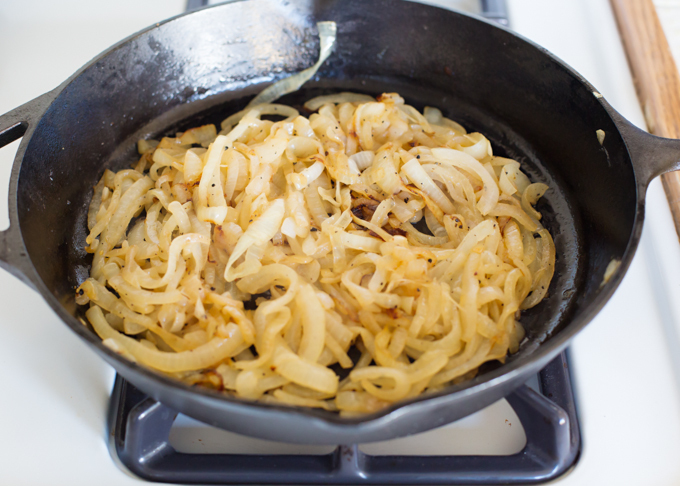 20-30 minutes or until onions are translucent and tender, and just beginning to turn a light golden brown. Add sugar and balsamic vinegar and continue to cook over low heat for another 20 minutes, until onions are dark in color and sweet. Season meat with salt and pepper. Divide into equal size patties (size depends on bun size). BBQ as you would normally BBQ a burger. Top with 2 slices of american cheese. Lightly toast buns on buttered grill pan. Generously spread Donkey Sauce on bottom bun, add burger, add shredded lettuce, and tomato slice. 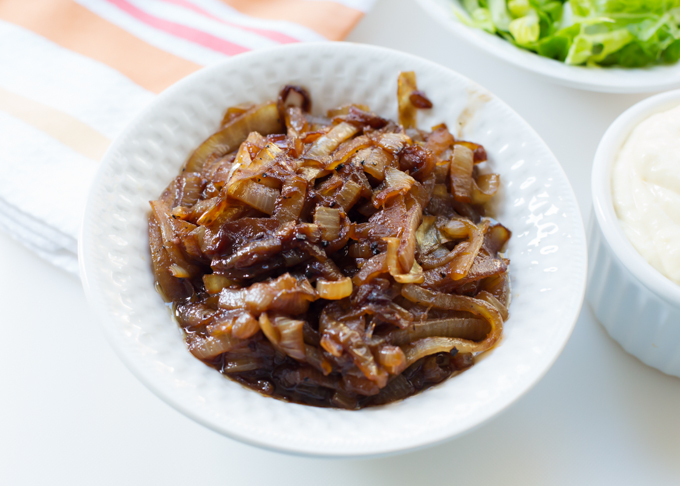 Top with a balsamic onions (don't be shy, they're yummy). Spread more Donkey Sauce on top bun and place on top of bottom burger stack. Get lots of napkins and enjoy!! This looks absolutely mouth watering, Renee! YUM! Your grandson is just too cute! Not many children would go for the cookbooks – WTG Beckett! This burger looks like DaBomb! Delicious. 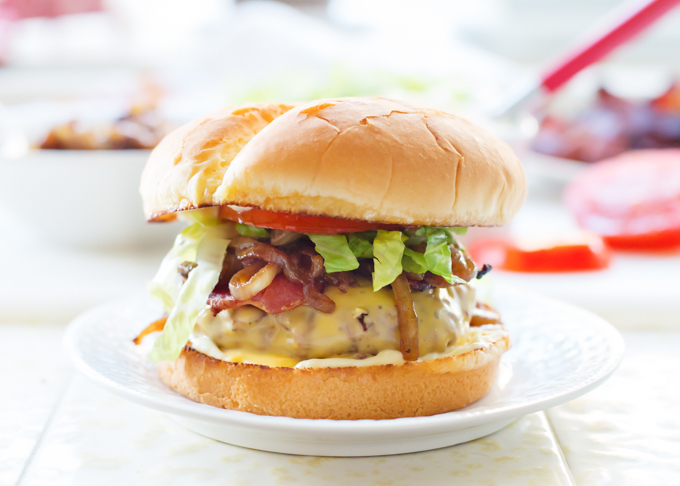 Oh Reneee, this burger sounds delicious (looks it too), but I adore properly caramelized onions and even more so with balsamic vinegar, can I have a big bowl of those just as an accompaniment? Sweet story Renee! I am impressed with Beckett! He’s well on his way to ruling his own kitchen someday. I wish the men in my house would catch fire! Those balsamic onions are definitely ‘the bomb’! I bet this was one exceptional burger. Looks delicious!